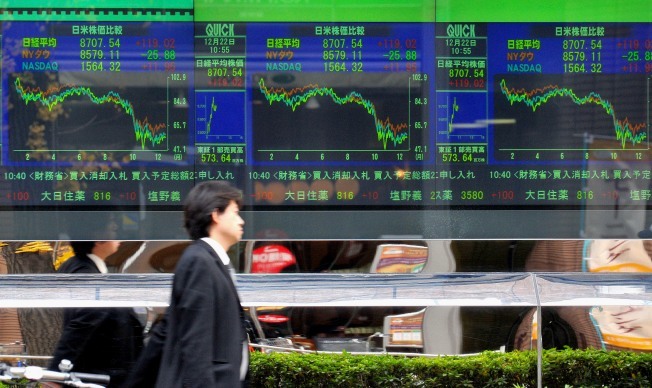 The benchmark Nikkei index rose 121.90 points, or 1.419 percent, to 8,710.42 points in the morning trading. HONG KONG – Asian stock markets were mostly lower Monday as a U.S. pledge to loan troubled automakers $17.4 billion failed to ease worries about a deteriorating world economy. The emergency help announced Friday for General Motors Corp. and Chrysler LLC came as a relief to many investors, staving off bankruptcies that would have only deepened the recession in the world's largest economy. But concerns about the global outlook, as well as falling demand for the Asian-made products like cars and electronics that drive regional growth, continued to weigh on investors, analysts said. In Japan, figures showed a record 26.7 percent plunge in exports last month compared to a year ago. "The big question about what's going to happen with the big U.S. automakers has been settled for now," said D. Gorton, research analyst at Louis Capital Markets in Hong Kong. "But investors are still wondering what's going to happen with the U.S. and ... when the U.S. economy is going to recover." Trading volumes across the region were light in the run-up to the year-end holidays. Hong Kong's Hang Seng Index dropped 1.7 percent to 14,874.61, and Australia's key index was down 1.6 percent. South Korea's Kospi dipped 0.2 percent after opening higher and Singapore's benchmark was down 0.5 percent. Tokyo bucked the regional trend, with its Nikkei 225 stock average rising 130.68 points, or 1.5 percent, to 8,719.20 despite the latest bad news about the country's exports. Japanese investors seemed focused instead on the U.S. auto rescue, helping to buoy No. 2 carmaker Honda by 3.5 percent, as well as a weakening yen and last week's interest rate cut from the country's central bank. Markets in India and Malaysia also advanced. Oil prices edged higher on measured optimism that the auto bailout, as well as a sharp decline in U.S. interest rates, would help cushion the global slowdown. The January contract rose 71 cents to 43.07 in Asian trade on the New York Mercantile Exchange. The February contract settled at $42.36 on Friday. In Hong Kong, heavyweight HSBC lost 2.5 percent, pressuring the broader market, after the bank's credit outlook was revised to negative by ratings agency Standard & Poor's on Friday. Last week in New York, Wall Street finished a choppy session mostly higher. The Dow fell 25.88, or 0.30 percent, to 8,579.11. The Standard & Poor's 500 index rose 2.60, or 0.29 percent, to 887.88. U.S. futures were up modestly, meaning Wall Street was poised for a higher open. In currencies, the dollar strengthened to 89.98 yen, up from 89.24 yen, and the euro rose to $1.4007 from $1.3913 late Friday.